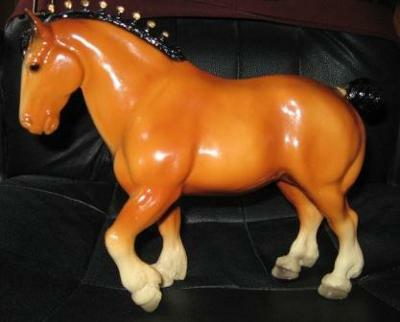 What comes to mind when I think of a vintage Breyer model is history. Older models, (> 25yrs) if they are lucky enough, have a way of circulating hands, either via estate sales, auctions or perhaps even passed down from one family member to another. Imagine if a model could talk, the kind of stories it could tell. I think it is really special when you happen upon a vintage model with special character flaws. That itself speaks volumes about the owner that once cherished it. For example; I particularly remember once coming across a very old model in an antique store with a name etched on its belly. I couldn't help but wonder as to the nature of that person, what age they may now be or whether or not they ever wondered what happened to it. I'd have to say anything over the 25 year mark is considered vintage to me. I started collecting in 1983-84ish. my first model was "Midnight Sun" and still collecting today. You two are so funny! And so right! I agree with one hundred percent. I have wondered the same thing myself as well about different models I have purchased. Vintage models-if they could talk! Oh Boy, Bonnie! You are so right! If my old models could talk, what stories they would tell! I enjoyed your "take" on vintage models!